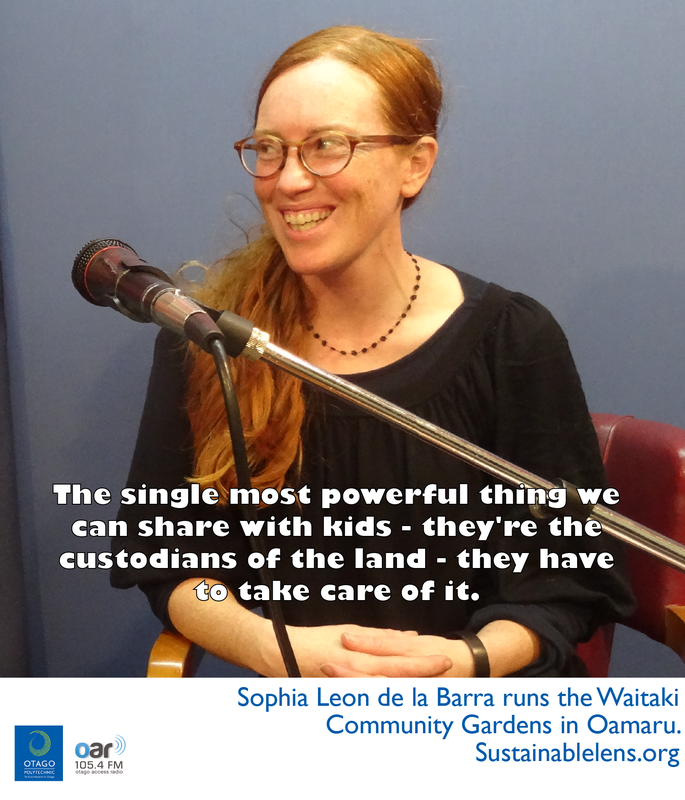 Sophia Leon de la Barra is the coordinator for the Waitaki Community Gardens in Oamaru. Trained as a statistician in public health, she now runs the community gardens as a community, education and social hub. A glossy magazine for a sustainability strategy didn’t really feel like sustainability in action or practice. I feel like a contemporary custodian of the land. I found Oamaru and was fascinated that these eccentric people could be celebrated, and work together. Our philosophy is around sharing life skills. Gardening has skipped a generation, an effect of the commercialisation of supermarkets and urbanisation. The knowledge is there, we just need to tap into that wisdom. My job is really about people. Community gardening is about food production, but also valuable learning opportunity and social experience. Plant a seed, pull a weed, harvest a vege. (On community gardens and time banking in Lyttleton) Sometimes you need a bit of a crisis to drive you to into an alternative economy. Adversity reveals character and reliance on neighbours. Food is one of those integral things. It is all too easy in a globalised economy to eat food from all over the world, but the environmental cost is not really factored in…how can a Korean ice-cream be cheaper than a local one? When people start looking at the logistics of global systems – this is crazy. Growing food connects people to their environment. Growing your own food is an empowering experience – it just tastes better. If people want to engage it can scale up. I measure our success by how well we are doing in sharing knowledge with the next generation. We’re reconnecting kids wit the process of food, with cycles of nature. Everybody’s got this about collaboration and making things happen. A can do attitude – everybody’s got their own projects – so they totally get it, they get you want to do something new and want to help you. The community garden, community hands in soil – truly intergenerational. 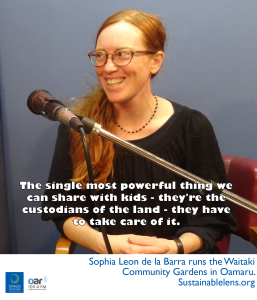 The single most powerful thing we can share with kids – they’re the custodians of the land – they have to take care of it, and here’s some ways how. (Activist?) Yes. Activists are people who just do things really. If you get something done and it creates a positive change for someone else, then you’re acting on your principles, implementing – activism. (Motivation?) Well-being of people, health is our greatest wealth, and the more we can do to share that the stronger we’ll be as a whole. (Challenges?) Get more involved in Council – I’m standing for election next year. (Miracle?) Make everybody more time rich, so they can engage in community projects. (Advice?) If you’ve got something you’re passionate about, dig it, do it.